Autonomous commercial floor scrubbers are new in the floor cleaning market and over the next 7 years they are expected to be in trend all over the market. Goldstein Research analyst forecast that the global autonomous scrubbers market is expected to reach USD 4,330 million by 2024, from an estimated USD 1,630 million in 2017, growing at a CAGR of 14.7% during 2017-2025. One major trend in the market is internet connected autonomous cleaning robots in smart commercial spaces. As much as 95% of the cost of cleaning a floor is labor, thus the high cost of this simple task has inspired alternative solutions with the manufacturing of robotics floor scrubbers. Although it is likely to still take some time to reach its full investment potential, the robot sector looks promising for further development. The positive trends in robotics market so far and development has been rather gradual, but it is picking up speed with positive impact on the growth of autonomous commercial floor scrubbers market. Around the world, new players and markets are emerging that will take on an important role in the ongoing development of the robotics industry. Technologies like AI, machine vision, voice and speech recognition, tactile sensors, and gesture control will drive robotic capabilities far beyond what is possible today, especially in terms of autonomy. Airports segment is expected to harness highest market share of 29.3% in 2017 and over the forecast period it is expected to reach nearly USD 1,264.36 million by 2025. Airports segment is followed by Hospitals, hotels and retail stores/warehouses. Based on geography, Asia-Pacific region accounted for largest revenue share of 37.5% in 2017 of the global autonomous commercial floor scrubbers market on the back of large number of autonomous commercial floor scrubber’s manufacturers in the region, supplying the products all over the world. APAC is closely followed by North America and Europe. North America region is expected to grow at a CAGR of 14.6% over the forecast period. The report covers the present ground scenario and the future growth prospects of the autonomous commercial floor scrubbers market for 2017-2025 along with the market players’ analysis. We calculated the market size and revenue share on the basis of revenue generated from major players in the Global region. Global Autonomous Commercial Floor Scrubbers Market Outlook 2017-2025, has been prepared based on an in-depth market analysis from farm market experts. The report covers the competitive landscape and current position of major players in the Global autonomous commercial floor scrubbers market space. The report also includes porter’s five force model, SWOT analysis, company profiling, business strategies of market players and their business models. “Global Autonomous Commercial Floor Scrubbers Market Report” also recognizes value chain analysis to understand the cost differentiation, pricing models to provide competitive advantage to the existing and new entry players. 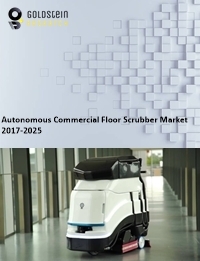 Our Global autonomous commercial floor scrubbers market report comprises of the following companies as the key players: Nilfisk, Tennant, Koninklijke Philips N.V., Brain Corporation, iRobot Corporation, Diversey, ECOVACS ROBOTICS, Adlatus, Discovery Robotics, Amano Corporation, Hayward Industries, Haier Electronics Group Co Ltd, ILIFE Robotics Technology, Miele & Cie. KG, Avidbots Corp., etc.